Trevor Morris Engines was established in 1989 and has become one of the UK’s premiere motorsport engineering and manufacturing company. With over 20 years of experience, TME’s team of experienced race engineers use the latest product design, manufacturing and testing equipment available. An online shop of components is also available. From concept to design, development, delivery and beyond. 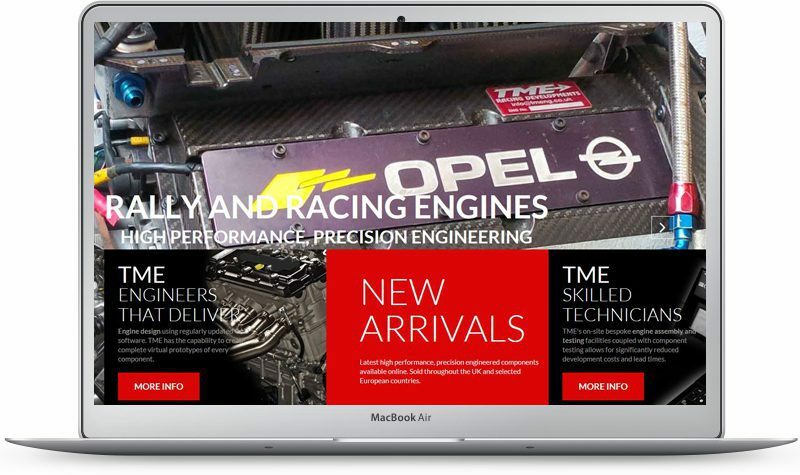 When it was time to update the look of Trevor Morris Engines website, Alpha Designs quickly understood what we wanted and made it happen easily. Through phone calls and email correspondence we were able to make our new site appealing, informative and easy to navigate. Cheryl added creative touches to make the site professional and inviting. Thanks, Alpha Designs! Alpha Designs offers a great service in website design, development and marketing of your website. We strive to offer the best solution for your business and impartial advice at an honest price. We are constantly investigating new technologies and recommend them when they make sense. We love what we do, some might say a bit too much, and we bring enthusiasm and commitment to every project we work on. Put simply, if you want a partner who cares about your business choose Alpha Designs. Specialist web designers based in Hereford servicing Herefordshire, Worcestershire, Gloucestershire, Shropshire &amp; POWYS.